We’d love your help. Let us know what’s wrong with this preview of Nana Duck by Katherine Tallentire. Nana Duck is a beautifully illustrated and light-hearted children’s storybook, perfect for reading aloud to pre-school children. The illustrations contain lots of small details for pointing out to the young audience. It is a fun tale that celebrates the relationship between grandparents and their grandchildren. 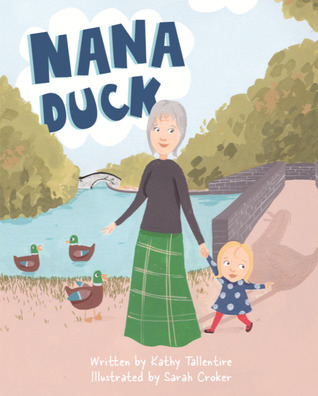 It explores how language can sometimes be confusing for childre Nana Duck is a beautifully illustrated and light-hearted children’s storybook, perfect for reading aloud to pre-school children. The illustrations contain lots of small details for pointing out to the young audience. It is a fun tale that celebrates the relationship between grandparents and their grandchildren. It explores how language can sometimes be confusing for children and how this can lead to kids saying the funniest things. Is Nana all that she seems? To ask other readers questions about Nana Duck, please sign up. 16 would read another book by this author. 15 thought the cover was good or excellent. 17 felt it was easy to follow. 17 would recommend this story to another reader to try. 16 felt the pacing was good or excellent. 16 thought the author understood the readership and what they wanted.